This is a fabulous dressing for vegetarians and carnivores alike! It’s hearty and delicious. In a very large skillet, melt butter over medium heat. Add onions and celery. Sauté until onions just begin to turn translucent, about 7 to 8 minutes. Remove from heat. In a large bowl, combine onion mixture, apples, nutmeg, salt, pepper, sage, cloves, thyme and cinnamon. Stir in nuts and cranberries. Mix in stuffing bread. Add vegetable broth and stir until stuffing bread is evenly moistened. Transfer stuffing mixture to a large Pyrex dish and bake at 350 degrees for 35 minutes. Stir. Serve immediately. 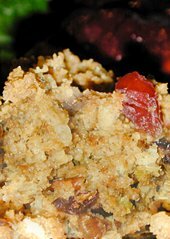 This entry was posted on Thursday, September 6th, 2007 at 12:14 pm	and is filed under Holiday & Seasonal, Master Recipe Index, Side Dishes, Speed Queen (30 min/less), Vegan or Vegan-able, Vegetarian. You can follow any responses to this entry through the RSS 2.0 feed. You can leave a response, or trackback from your own site.